BACON: It's not just for breakfast anymore. Everybody's favorite pork product has hit the dining room in a whole new array of delicious guises from sticky-sweet bar snacks to smoky bourbons to decadent butterscotch-filled doughnuts. And ba-connoisseurs not to mention the blogs, clubs and societies that cater to them are salivating for more. The latest entry in the bacon bonanza: this Sunday's Bacon Takedown at Radegast Hall (113 N. Third St., Williamsburg, Brooklyn) in which 30 contestants will "ride the bacon war pig" by each whipping up a bacon-based dish. For $10, attendees will get to sample them all, then vote on their favorite. "I imagine it being total pandemonium," says event organizer Matt Timms, who is capping attendance at 300. "I semi-anticipated that there'd be a bacon cult, but I didn't realize how insane they'd be. People love bacon. Obviously. I mean, it's delicious." "It's probably the ultimate cooking competition ingredient," says Nick Suarez, 26, who is planning to make a bacon sloppy Joe with tangy Mexican crema. But not all contestants are going the savory route. "Bacon is fatty, salty and tastes good on anything including cupcakes," says Keavy Landreth, the 26-year-old owner of Kumquat Cupcakery, who is creating a maple pecan and bacon cupcake for the competition. Indeed, Landreth likens bacon's popularity to that of the cupcake both have always been considered delicious, even if they seem to be capturing an inordinate amount of the public imagination lately. Such cultlike devotion will be explored in "Bacon: A Love Story," blogger Heather Lauer's forthcoming paean to pork. Promising to be the "most comprehensive book about bacon to date," it will include sections on cooking and curing methods, not to mention the occasional recipe for bacon brownies and even a bacon Bloody Mary, when it's published in May. When Lauer started her Bacon Unwrapped blog almost four years ago, the bacon craze was just getting under way. Now, bacon sales are up and while Lauer thinks the trend is at least partly "media driven," she says its popularity can also be attributed to "a backlash to political correctness finding its way into food." Sure, we're striving to eat healthier, but bacon appears to be "the one thing that people are unwilling to give up," she says. Fittingly, the big question at Sunday's Bacon Takedown is whether any of the contestants will show up with a version of the Bacon Explosion the barbecue recipe that became an Internet sensation a few months ago. A variation on what's known in the barbecue world as a "fattie," it's basically a monstrous bacon-wrapped, bacon-stuffed sausage. "There's an element of shock to it," admits its co-creator Jason Day. Even more shocking: Day and his bbqaddicts.com partner Aaron Chronister just landed a six-figure book deal with Scribner and expect their cookbook (working title: "Barbecue Makes Everything Taste Better") to hit shelves in 2010. Not bad for a couple of guys from Kansas City who hit the competitive barbecue circuit only last year. "The Bacon Explosion made me want to throw up. You can go too far with anything especially a rich food like [bacon]," says contestant Jennifer Sanders, 32, of the Upper East Side. Still, she says she plans to make a tamale featuring three kinds of bacon at the Takedown. The Bacon Explosion is just the latest example of bacon gone berserk you can now buy bacon-flavored mints and bacon-print suits prompting a bacon backlash of sorts in the media. Last year, Salon published an article that asked, "Will hype and gimmickry (bacon cocktails, anyone?) spoil the great salty meat?" Local food blog Grub Street has also been critical of the bacon juggernaut, boldly declaring it had "jumped the shark" meaning the craze has gotten so over-the-top, it's become a parody of itself. "What is more annoying than an overexposed trend? How about people who think it's trendy to declare a trend dead?" wrote Heather Lauer in Bacon Unwrapped earlier this month. Bacon Takedown's Timms agrees. "All it will ever be is delicious . . . I don't see people getting sick of bacon anytime soon." In fact, Timms was so incensed by the suggestion that bacon was "over," he wrote a defense of it on his blog, chili-takedown.com: "I can understand hating on skinny jeans and faux-hawks and sunglasses at night, but bacon? The fact that bacon is getting a little bit more love than usual in this day [and] age is a GOOD THING! Bacon is hip right now? I love 2009!" * At Midtown newcomer Atria (13-15 W. 54th St.; 212-262-4600), smoky bacon "powder" made from bacon drippings, salt and modified tapioca starch lends a savory touch to warm butterscotch-filled doughnuts. * Bar snacks: There's nothing candylike about the bacon peanut brittle at popular East Village tavern The Redhead (349 E. 13th St.; 212-533-6212). Instead, think bar nuts with a twist: A bowl of peanuts gets intensely smoky flavor from bits of bacon while cayenne pepper adds a touch of heat. Craving salty-sweet? Sticky maple and bacon roasted almonds at Buttermilk Channel (524 Court St., Brooklyn; 718-852-8490) and candied bacon at General Greene (229 Dekalb Ave., Brooklyn; 718-222-1510) can't be beat. * Booze: The mad-scientist bartenders at East Village bar PDT (113 St. Marks Place; 212-614-0386) use a technique called "fat-washing" to subtly infuse brown booze with bacon. Try it in the bar's signature Benton's Old Fashioned: bacon-infused Four Roses bourbon, maple syrup and angostura bitters. At Double Down Saloon (14 Avenue A; 212-982-0543), bacon-infused vodka is used to make the house martini, not to mention an eye-opening Bloody Mary. 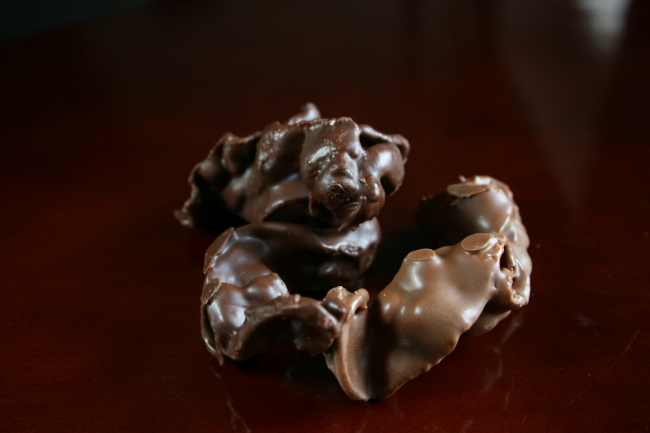 * Candy: Taking the chocolate-covered pretzel to the next level, tiny chocolatier Roni-Sue (No. 11/12 Essex Street Market, 120 Essex St.; 212-260-0421) offers an assortment of bacon treats playing on salty-sweet, including crunchy pig candy i.e., chocolate-covered bacon that comes in both milk and (even better!) dark varieties. Meanwhile, chile pine nuts add some spice to scrumptious "BaCorn" crisp caramel popcorn with sticky bits of bacon and rich bacon buttercrunch. * Sandwiches: Sure, BLTs are great but minus the LT they're also pretty darn tasty. David Chang built his Momofuku empire (multiple locations; momofuku.com) on the strength of steamed buns filled with lush pork belly, cucumbers, scallions and hoison sauce. Or do like the Brits, and slather a bacon sandwich English back bacon on buttered white bread with tangy HP sauce at Tea & Sympathy (108 Greenwich Ave.; 212-989-9735).